Applied Sciences’ move, the laying out of Kluyverpark and the development of Technopolis raised demand for catering in the southern campus area. 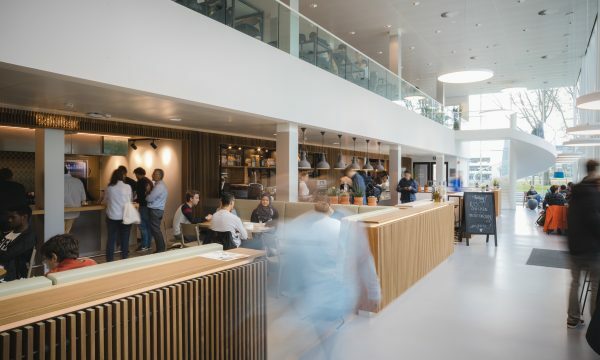 The range currently on offer was also no longer aligned with TU Delft’s food and beverage vision. What that entails will be borne out by the new, catering concept at The Fellowship. This features three different food counters, combined eating/work spaces, a large patio and a pitch for a food truck. Aldert Kamp studied Space Engineering at TU Delft at the close of the 1970s after which he started working for Fokker. In 2002 he returned as a lecturer and he later became the Director of Education at the Aerospace Engineering faculty. To substantiate the BSc programme in a modern manner with more activating education, he had a prefab building brought over from Hogeschool Rotterdam [university of applied science]. He christened it The Fellowship, a subtle reference to the collaboration between the Irish and Fokker. Dennis Cruyen is from the hotel industry, once engaged in facility management in healthcare and has now been working for TU Delft for some ten years. Currently as Process manager catering, events and retail at FMRE (Facility Management & Real Estate).